He has become the first judge to be elevated as Chief Justice of a High Court since April 13, 2015 when the NJAC Act was brought into force. The newly appointed Chief Justice of Gujarat High Court Justice Ramayyagari Subhash Reddy was administered oath of office by Gujarat Governor O P Kohli in Rajbhavan yesterday. Chief Minister Mrs. Anandiben Patel, various ministers, Speaker of Gujarat Assembly Ganpatbhai Vasava, honourable Judges, Chief Secretary G R Aloria and other dignitaries were present on the occasion. 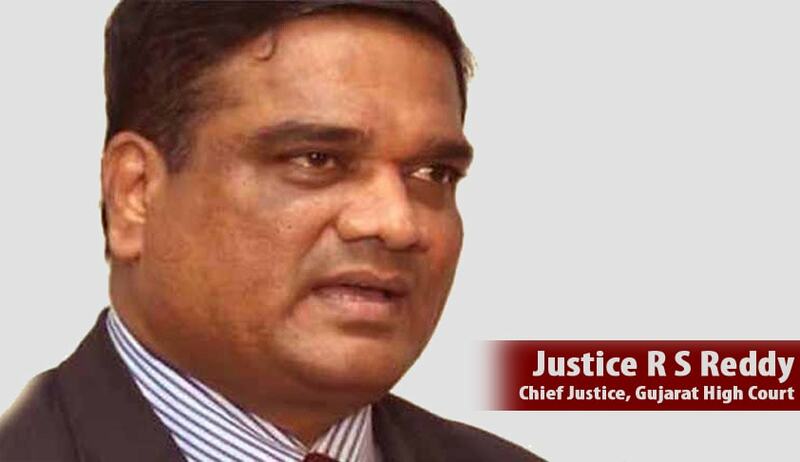 Justice Reddy,a judge of the Andhra Pradesh/Telangana High Court, who has been elevated as the Chief Justice of the Gujarat High Court has replaced the acting Chief Justice Justice Jayant Patel who has been transferred to Karnataka High Court as a judge. The announcement of Justice Reddy’s elevation was done on February 3. He has become the first judge to be elevated as Chief Justice of a High Court since April 13, 2015 when the government had brought into force the National Judicial Appointments Commission Act, which had overturned the collegium system of appointing judges. Though the NJAC Act was struck down by the apex court on October 16 last, no fresh appointment of Supreme Court and High Court judges took place as the top court was hearing ways to improve the collegium system. Earlier this month the Central Law Ministry had reported that out of the approved strength of 1,044 judges in the 24 high courts, there were 443 vacancies. The Apex Court, which has an approved strength of 31 judges, was reportedly having five vacancies. Collegium recommendations for Chief Justices of Rajasthan, Patna, Gauhati, Meghalaya and Karnataka High Courts are reportedly under process. The government and the judiciary had reached an understanding to extend the tenure of additional high court judges between three and six months till they were considered for elevation as permanent judges to check rising vacancies.